Clearly and sensitively written for young readers. Charles Randolph really did become Jackson's courier after he picked up the General's glove at Port Republic. The records tell of Jackson's commendations of Charley to Lee and General Stuart's written reports in his praise. It's May 1862. The War Between the States rages relentlessly and news from the fronts is bad. But 16-year-old Charles Randolph, of the famous Virginia family, fears only that the war will end before he has a chance to enlist. How he steals away from home on one of his family's thoroughbred hunters and is caught up in Jackson's Valley Campaign is dramatically recalled in Stonewall's Courier, which is based on a true account. With the turbulent army, Charles awakens to the dangers and agony of war. Taking part in a retreat, and in his encounteres with men like the mercenary young mountaineer Quinton Hocks, he suffers more qualms. 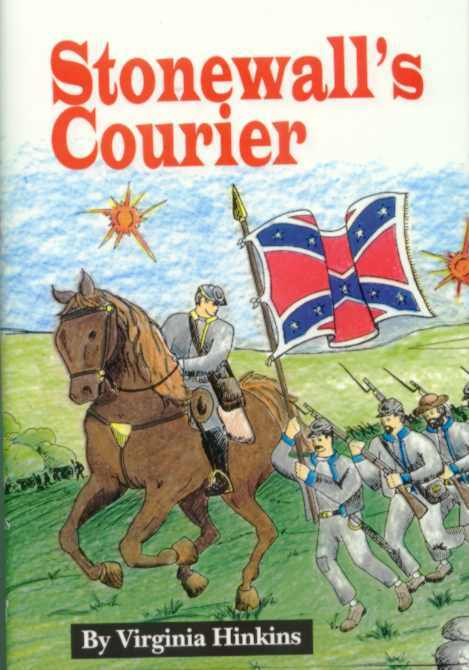 Then Stonewall Jackson appoints him his courier, and Charles is exhilarated. Through Charles's eyes we see Stonewall Jackson, Robert E. Lee, Jeb Stuart, Kyd Douglas. We join the marches, share the hunger and the glory, and experience the problems of a boy catapulted into the stern realities of war and its aftermath. Excerpt from chapter 1 . . . It was just past dawn as Charley Randolph watched his brother gravely shake hands with Father and swing into the saddle. The light from the rising sun glinted on the gold buttons of the young officer's jacket; there was the rattle of his saber and the quick crunch of steel horseshoes on the pebbly road. Robert paused and looked back at them, checking his prancing horse. The powerful gelding that had carried him fox hunting through the counties of Northern Virginia was now a splendid mount for the new Captain of the Black Horse Cavalry. The slaves were clustered at the door, and Silas, the farm foreman, said boastfully, Lawdy, ain't our Massa Robert purty? Charley stood on the porch of The Grove with his wide mouth spread in a grin of pride. Today was the end of May 1862, but the folks of Fauquier County couldn't take seriously the bad news from the fronts. A few more months and the South's gallant young men like Robert would end the war in a blaze of glory. I'm going with him, Charley thought. I'm sixteen. They have to stop treating me like a child.